St. Thomas & Eastern Railway used to have ex CN M420 #3568 around Tillsonburg ON on former CN trackage. The Railway is owned and operated by Trillium Railway (see also Port Colborne Habour Railway). 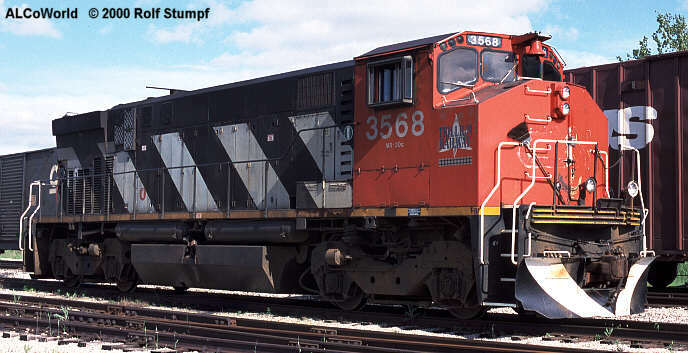 The 2nd unit #3575 was transferred to the Kelowna Pacific Railway (another NY&LE affilliate) in early 2000. The repainted 3568 was sent to the USA to the Oil Creek & Titusville Line of the NY&LE. After that it was leased to the Western New York & Pennsylvania. Ex-CN 3568 pauses at Tillsonburg. ON. June 2nd, 2000.